Money can buy all the luxuries in the world. In Dubai, the last name in luxury is none other than Burj Al Arab, the most exclusive accommodation, the only Dubai 7 star hotel. Burj Al Arab is one of the most iconic symbols of Dubai. Designed to look like the sail of a dhow that is being blown by the wind, Burj Al Dubai sits on a manmade island just off the Jumerai Beach. Burj Al Dubai was designed by Tom Wright for WS Atkins PLC and was constructed by Murray & Roberts of South Africa. Burj Al Arab is the embodiment of a vision in design that is the marriage of various elements. Its façade is among the best examples of ultra-modernism while its interiors are lavish with eastern and western influences. Among the extravagant features of Burj Al Arab are 22-carat gold leaf spanning 8,000 square meters and 30 different types of marble spanning 24,000 square meters. The building also has the tallest atrium in the whole world. For all its height and size, Burj Al Arab has only 28 floors, and these floors house 202 duplex suites. There are eight types of suites in Burj Al Arab, with each suite containing a separate living and dining area, as well as an office area equipped with its own laptop, printer, copier, fax machine and Internet access. Some suites have a Jacuzzi bath while some have spa baths. Some suites include a kitchen and the services of a butler. Most suites offer a panoramic view of the Arabian Gulf and the city of Dubai itself. Guests at Burj Al Arab can also avail of various leisure activities that are not offered anywhere else. These include a scenic tour of Dubai over helicopter, a yacht charter, and shopping while chauffeured around Dubai in a Rolls-Royce. Guests of Burj Al Arab also have exclusive access to the Majles Al Bahar private beach, to the Wild Wadi Water Park and to various world-class golf courses in Dubai. They can also indulge at the Assawan Spa and Health Club. As for dining, Burj Al Arab has some of the world’s best restaurants. Al Muntaha offers a magnificent view of the World Islands from the height of 200 meters, enjoyed while dining on Mediterranean cuisine. Al Mahara, on the other hand, is hailed by Condé Nast as one of the ten best restaurants in the world. All this luxury, of course, comes with a price. 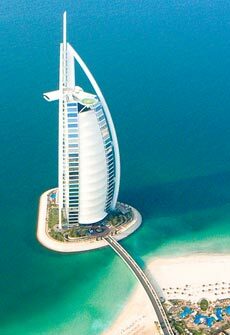 Burj Al Arab is one of the most expensive hotels in the world. A stay of one night in one of Burj Al Arab’s deluxe suites would cost a minimum of US$1,000. The most expensive suite is the Royal Suite, wherein one night’s stay comes at a price of $28,000. Burj Al Arab is one of the most beautiful and one of the most symbolic structures in Dubai. It is one of the last names in luxury, whether in Dubai or anywhere else in the world. Copyright Dubai Travel & Vacation Guide. All rights reserved.